The vehicle was ordered in September 2017 as part of a package of counterterrorism measures. It is made by Rheinmetall MAN Military Vehicles and is specially configured for the needs of the Operations Directorate of the Berlin Police. 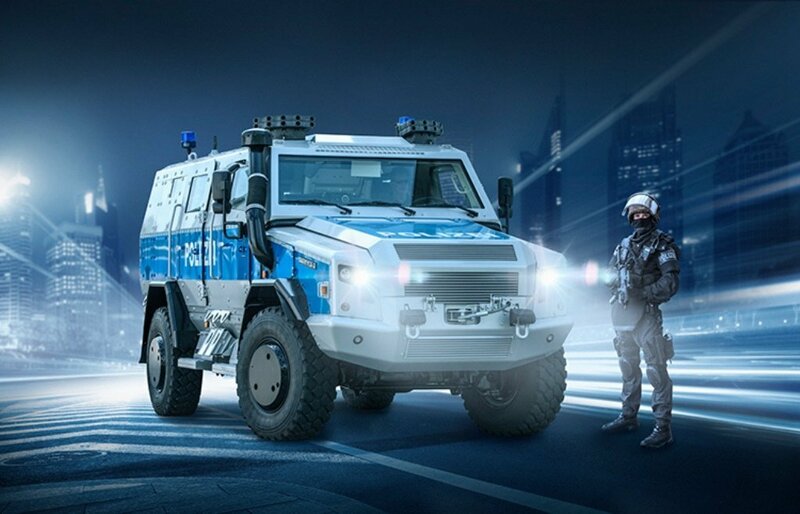 The high-mobility vehicle Survivor R of Rheinmetall is developed in cooperation with Austrian special vehicle maker Achleitner and is superbly suited to police SWAT team-type operations. Vehicles of that type are intended for use in high-risk situations when special operators need to be safely transported to the area of operations, or for evacuating persons. The large and bright vehicle interior is easy to clean and there is sufficient space for up to 10 crew members including personal equipment and various command and communication equipment. The Survivor R is a perfect combination of mobility, protection and payload offering an optimal support solution for modern armed and Special Forces in all operating environments. It is designed in civil appearance and can be customized by optional equipment packages according to the relevant police-specific requirements. The protected multirole vehicle Survivor R is based on a high-performance 330hp (242kW) 4 x 4 truck chassis by MAN, the combined all-wheel drive expertise of MAN and Achleitner. It is capable of reaching a top speed of over 100 km/h. The Survivor R is a cost-efficient, easy-to-maintain vehicle with low lifecycle costs and high operational readiness. Rheinmetall is an international powerful corporation based in Düsseldorf, Germany. It is the management holding company of the Rheinmetall Group featuring two sectors – Rheinmetall Defence and Rheinmetall Automotive. The Public Security product portfolio of the company covers an extensive array of relevant capability categories, including reconnaissance and surveillance, command and control, kinetic solutions, cyber security, force protection and tactical mobility.